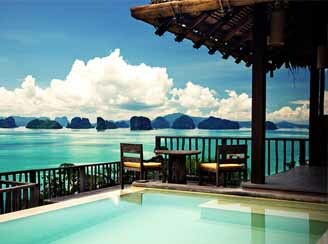 Thailand offers a unique fusion, blending contemporary luxury with traditional hospitality. Savor decadent five-star hotels, enhanced by a service that has its roots in culture and history. Escape to jungle retreats and beaches of seclusion, where boutique resorts provide silence and serenity. Stay at private villas, riverside resorts, palm-engulfed deserted islands, and amongst the blissful luxury that the country has developed. 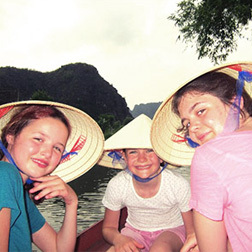 We’ve been arranging private Thailand tours for almost 25 years. In that time we’ve tested thousands of hotels, partnering with those that offer both modern luxury and exceptional service. This page contains a selection, but we have many more to recommend based on your preferences. 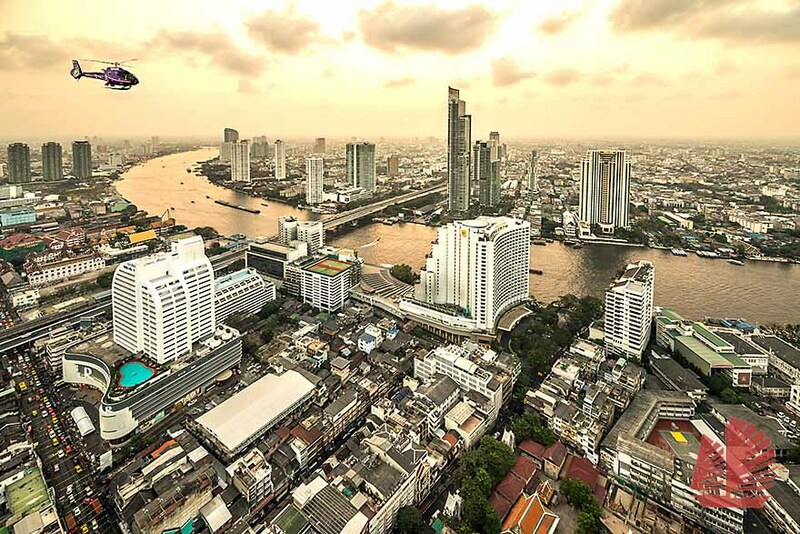 The Peninsula consistently ranks as a top three property in all of Asia, but the hotel has been our favorite in Bangkok over many years for several reasons including its riverfront location, stunning high tower views, and spacious outdoor grounds. 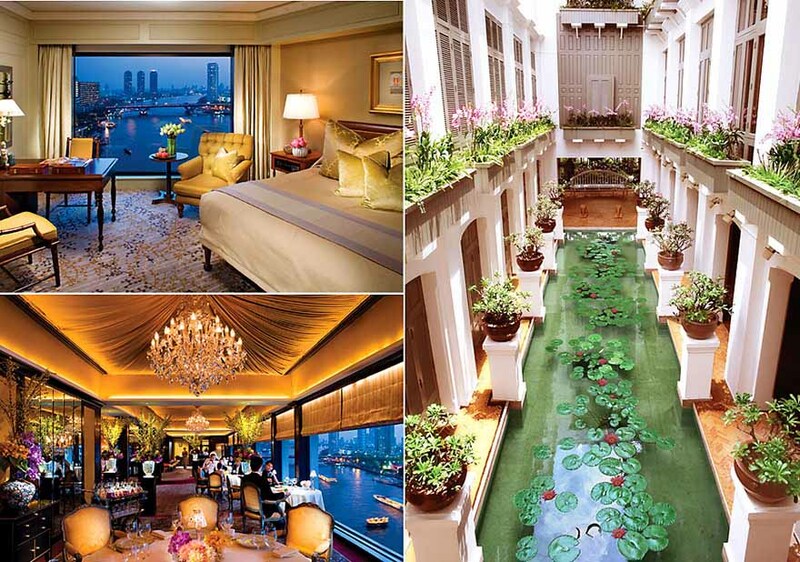 The Peninsula is ideally located, with convenient boat dock for cruising to Bangkok's riverside attractions, including the Grand Palace, Chinatown, flower market, and temples. It's a perfect hotel for families, but there is also a pleasant piano lounge and fabulous outdoor dining along the river. 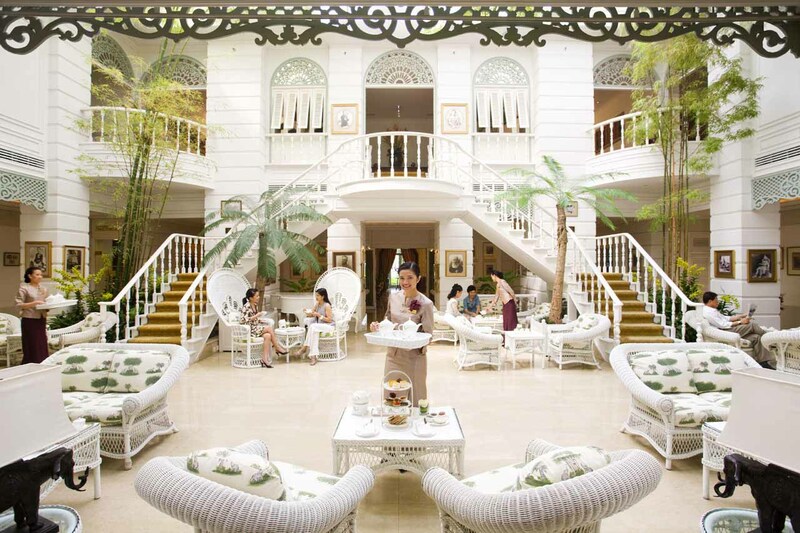 The spa was extensively renovated and is the finest in the Bangkok. 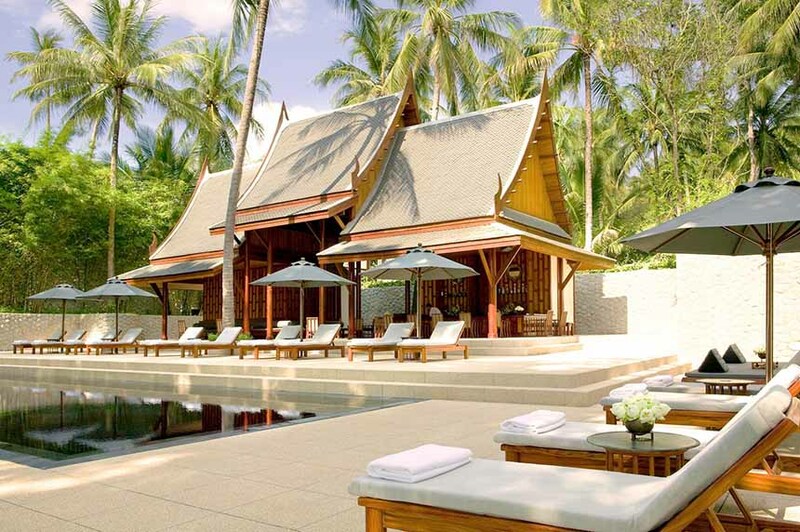 The Peninsula has a large pleasant outdoor pool with Thai-style lounging pavilions. There is also a modern fitness center. 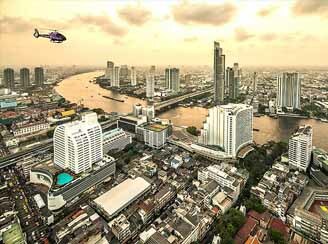 The incredible tower views of the river and to downtown are unparalleled by any other hotel in Bangkok. For those with curiosity about the Oriental, which lies across the river, a direct ferry takes three minutes and we recommend enjoying afternoon tea in the Author's Lounge (below). Top end dining options include Mei Jiang for fine Cantonese cuisine, Thiptara for Thai on the outdoor veranda surrounded by majestic banyan trees and lush tropical garden for a captivating dining experience by the river. As with other Peninsulas, room technology is state-of-the-art, with most aspects of room functions and hotel services seamlessly controlled by an tablet with simple, easily-to-use interface. The Peninsula is consistently rated a top-three property in all of Asia and with it's unique, high-tower balcony rooms with views over the river and city and provides The Oriental with genuine competition (we recommend the Peninsula for those with younger children over the more staid Oriental). 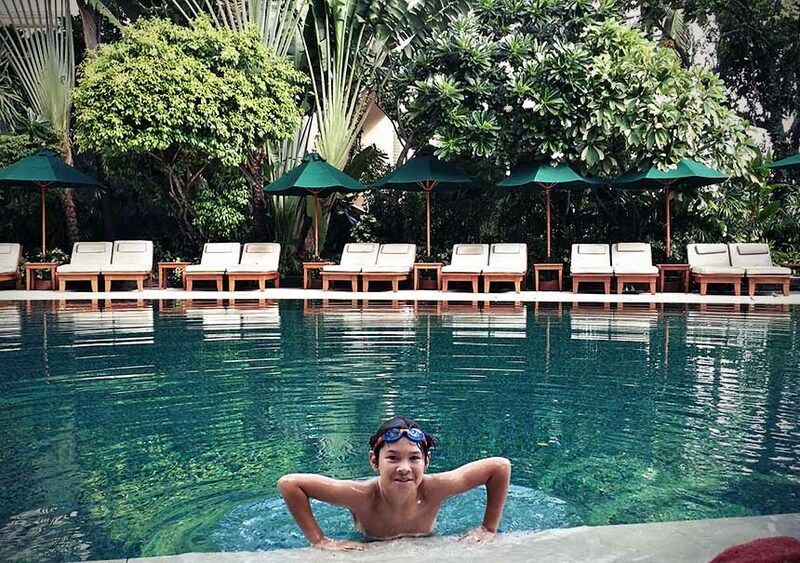 For more active, older children, the nearby Anantara Riverside has larger resort grounds and swimming areas. Too young or too hip for the Oriental? Bangkok's most celebrated hotel opening in years, the stylish Siam has arguably trounced the Oriental as the city's finest property. 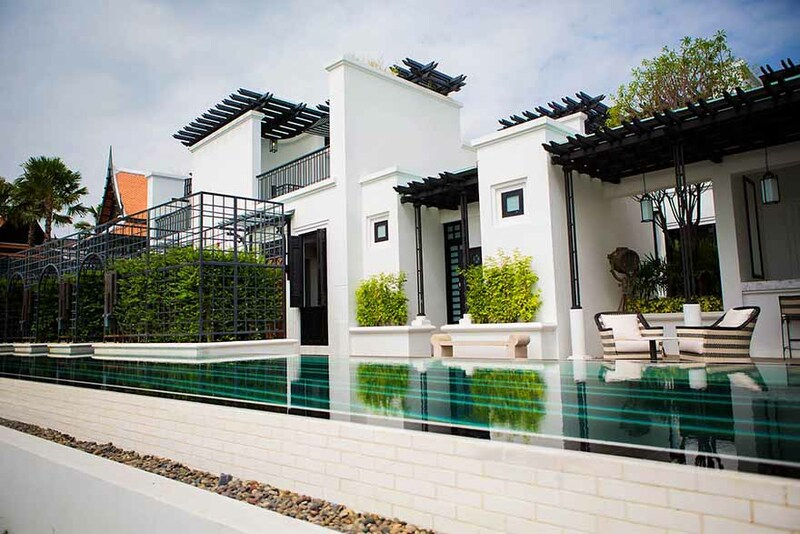 This newer and immaculate 39-suite luxury boutique retreat features individually designed rooms and pool villas with lofty ceilings, original turn of the century oriental artwork and antiques, with dedicated butlers on the eastern banks of the Chao Praya near the Grand Palace. The vibrant waterfront location offers mesmerizing views of the bustling river action, which we can hop into from the property's private pier. 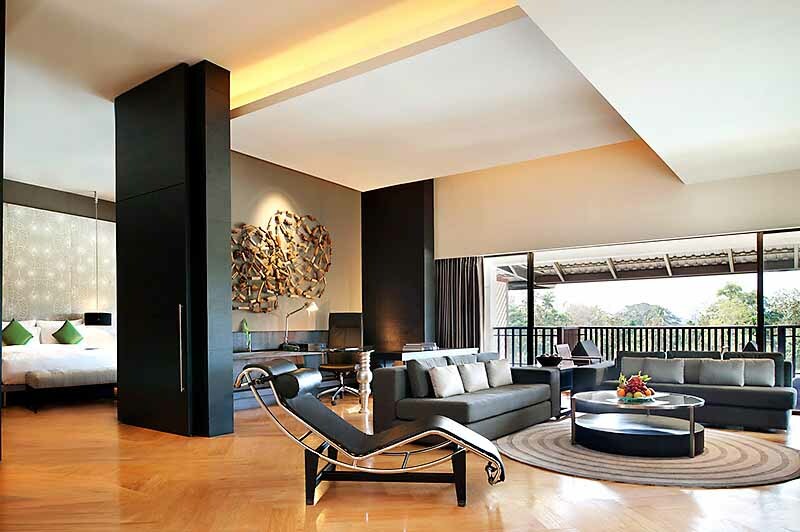 Bensley Design Studios, who have done work for the Oberoi and Oriental, have created a setting of understated elegance without the fuss of the Oriental and like luxury properties. Jules Kay observes "The art deco influences are reminiscent of the European architectural styles adopted during the reign of King Rama V during the 19th and 20th centuries." Facilities include a fully equipped gym with Thai boxing ring, outdoor yoga terrace, luxury spa, riverside infinity pool, and private pier for river excursions. Consider this property as a more intimate and newer alternative to the Oriental, a top recommendations for honeymooners. The Oriental is like Graham Greene-you can't visit this part of Asia without hearing about either one. 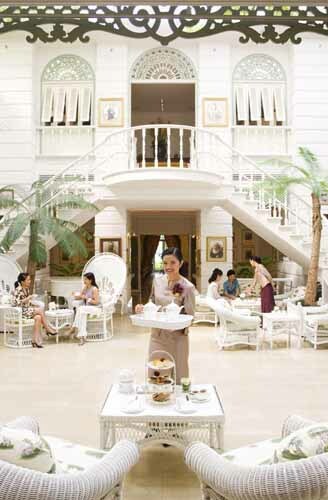 The legendary 1887 hotel is the Raffles of Bangkok with world-famous service that is equally part of the Oriental experience. Few other hotels in the world inspire such loyalty of past clients (the hotel is famous for remembering guest's preferences decades after their last stay). Now with an adjacent, modern tower, most rooms feature floor-to-ceiling windows looking directly onto the bustling river tableau. If prestige is paramount or you're curious to experience what the fuss is all about, then by all means this should be your first choice in Bangkok. The busy lobby is a popular meeting point for the city's social and business elite and world-class restaurants include Le Normandie for gourmet French cuisine, Lord Jim's for the city's finest seafood and Sala Rim Naam for traditional Thai cuisine featuring a nightly classical Thai dance show. Before or after dinner, the atmospheric Bamboo Bar features live jazz. Two outdoor pools, and via a quick ferry ride across the river, are the hotel's tennis and squash courts, premier health and beauty spa, children's day care center, and renowned cooking school. 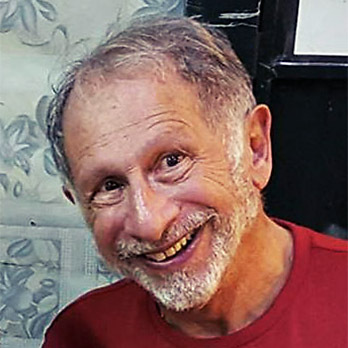 The standard of personal service is incomparable, marked by a personal butler, many who have served here for decades, who efficiently manage your every whim. The Mandarin Oriental features the ultimate midday oases for kids to escape the typically high heat and cacophony of the streets. The Oriental ice cream cart which cruises the pool area, features fresh hand made cream. The Oriental boasts the longest serving staff of any hotel in the world, with many on the job for decades. Take advantage of their local knowledge, they are a valuable resource. The best breakfast in Bangkok with fabulous views on the river, try the Thai style omelet. Even if not staying here, we recommend a visit for afternoon tea service in the splendid Author's Lounge or drinks at the Bamboo Bar (above). Formerly the Mandarin Oriental, The Dhevi is Chiang Mai's finest resort-even over the vaunted Four Seasons-an extraordinary, 60-acre property a few miles east of the city. 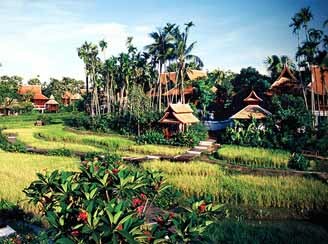 The best of the 123 lodgings are the dramatically designed and lavishly appointed villas grouped around meandering streams and idyllic rice paddies (above). 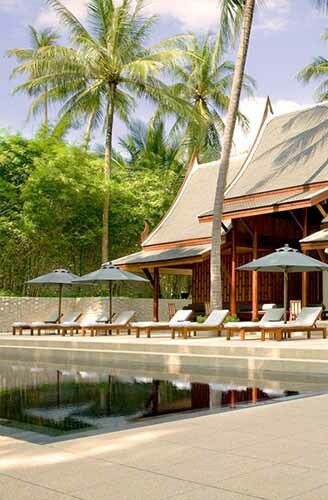 Most villas feature massive teak beams, Asian artifacts, and modern amenities. The palatial Grand Deluxe Villas are enhanced by spacious living/dining areas, huge master bedrooms with adjoining studies, teak-floored baths (double vanities, whirlpool tubs, walk-in showers), and terrace plunge pools and Thai-style lounging pavilions. Four splendid specialty restaurants (French, Mediterranean, Chinese, Thai) are complemented by the Oriental Culinary Academy for cooking lessons. Amenities include a split-level pool, tennis and squash courts, a health and fitness center and a the city's finest spa (18 treatment rooms), evoking the architecture of a modern Mandalay royal palace. Suite, from $740; Grand Deluxe Villa, from $1,450. Renowned, world-class property on par with the Mandarin Oriental Dhara Dhevi, this enchanting resort oasis lies in a picturesque valley, 20 minutes north of Chiang Mai. Landscaped gardens, water lily ponds, and terraced rice paddies surround the 98 large and distinctive guest pavilions and villas. These feature spacious teak-floored bedrooms, separate dressing areas, oversize baths (garden soaking tubs and shower stalls), and inviting gazebos. Thai and Continental restaurants are augmented by a casual café and charming Elephant Bar pavilion and excellent cooking school. Amenities include a 65-foot infinity lap pool, tennis, a fitness studio and sophisticated spa. Championship golf is available nearby. 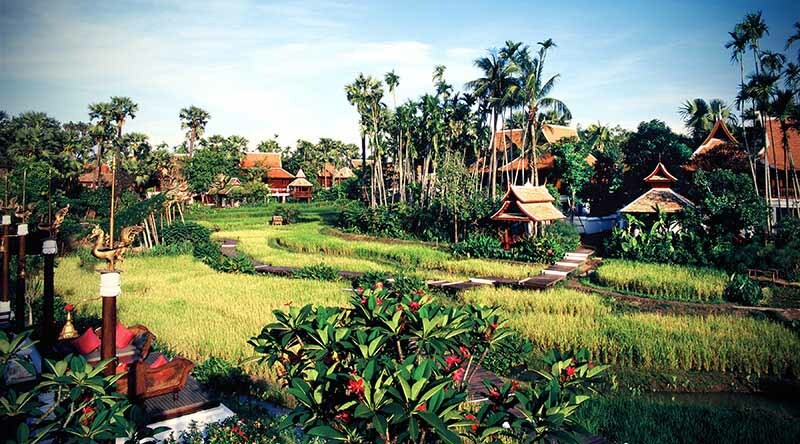 Upstairs pavilions offer rice paddy views. Childcare and kid's activities offered daily 9am to 5pm for children ages 4 to 12. Pavilion, from $965; Villa, from $1,450. An hour and half north of Chiang Rai and world's away from the cacophony of Bangkok, the tented Camp is situated in the remote mountains and furthest reaches of the Golden Triangle.The sublime "jungle camp" is set on a lush hillside with views through the jungle off into Myanmar and Laos. 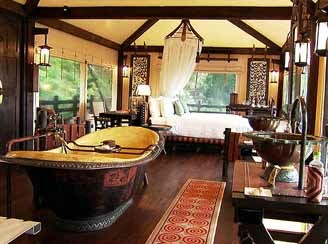 With only just over a dozen luxurious "tented" rooms, the tented camp is one of the most exclusive retreats in Asia, featuring hand crafted teak furniture and floors with safari chic amenities such as two-person hand-hammered copper bathtubs, leather-and-hardwood bush chairs, paddle fans and hardwood desk. Tented rooms are air-conditioned with indoor and outdoor rain showers, spacious deck area, and travelers will experience the warm and attentive service the Four Seasons and Thais are known for. 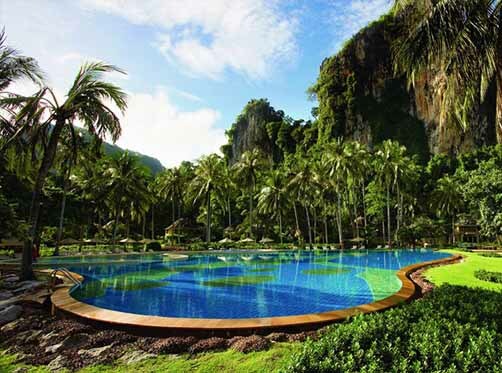 The camp also has free-form pool, whirlpool, spa pavilion, and dining venues, including a panoramic treetop bar and wine cellar, serving Thai, Laotian, Burmese, and Western favorites. Private meals can be arranged, including a picnic in the jungles further afield, candlelight dinner with Thai music, dinner atop a neighboring peak, and a private sunrise breakfast with the elephants at the Camp Peak. Resort experiences feature elephant trekking (learning to bathe, feed and drive an elephant, before climb aboard for a ride through the jungle), Mekong River excursions, journeying on a riverboat to meet local hill tribes, and a new herbal adventure in which the camp chef and a botanical expert take you foraging into the Camp's natural surroundings, where you'll learn about-and gather-a variety of plants used for local cuisine and traditional medicine. Three-Night Adventure Packages for one or two, all meals, open bar, camp activities and airport transfers included. 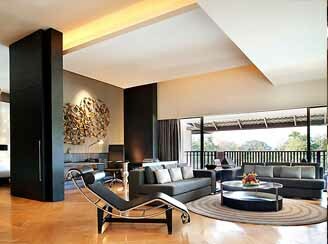 Other packages available in conjunction with Four Seasons Chiang Mai. Note: Children under 10 years not allowed without prior permission of G.M. For shorter trips, consider either the islands or this jungle oasis for your down time, but not both. If you are looking for more for a combination of resort with local culture, we have better recommendations where to spend your time. Let us plan an overland drive from Chang Mai, a scenic four-hour journey through the mountain valleys of the north, pausing at temples and villages along the way. This Mariott resort is the city's finest, situated on a tranquil two-dozen acre plot of land occupied by two magnificent, century-old raintrees on the banks of the Mae Kok River, and close to town. Italian is featured at resort's signature restaurant, Favola, situated on the river's edge. Spend part of your day soaking up the sun aside the large outdoor swimming pool, surrounded by lavish landscape gardens, and a gently meandering river with views of the mountains beyond. The stylish riverside spa is the perfect place to unwind after a long day of sightseeing, with a range of revitalizing massages, facials and body treatments by experienced professionals. The resort features a mix of activities, including therapeutic treatments and massage, two swimming pools, and well-equipped gym. Our outdoors itineraries will have you exploring the area's hill tribe villages, elephant sanctuaries, and river cruising. Phuket's finest resort. The renowned, visually stunning Amanpuri is terraced into palm-shaded hillside above an exquisite white-sand cove (only an hour by air SW of Bangkok). The entire enclave conveys a beguiling Thai-Buddhist ambiance. A maze of walkways and steep stairs provides access to the 40 luxurious all-suite accommodations. In addition, there are 30 multi-bedroom Villa Homes. Two informal open-air restaurants offering Continental, Thai and Italian cuisine flank a serene 100-foot freshwater pool. Other facilities include tennis, a sophisticated indoor/outdoor spa and a fitness gym. Championship golf is available nearby. Scuba diving excursions and cruises to the Phi Phi Islands and dramatic Phang Nga Bay can be arranged on the resort's fleet of charter yachts and speedboats. A romantic and cosmopolitan sanctuary. Two- to Six-bedroom Villas with private pools on request. 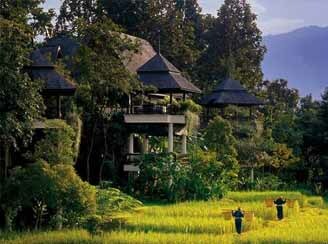 Consider the Six Senses Sanctuary (below) for a more remote property. 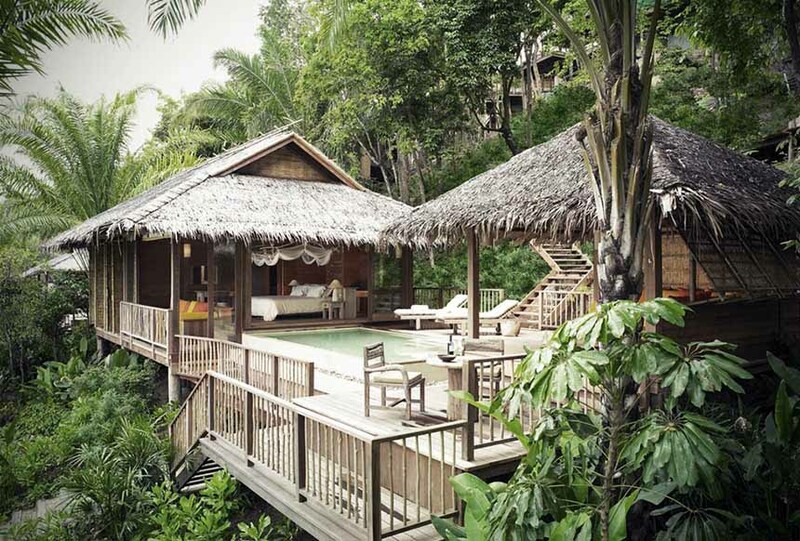 Aman, Soneva Kiri, or Six Senses? Phuket or Samui? Weather? Give us a call and we'll help you determine the perfect place. 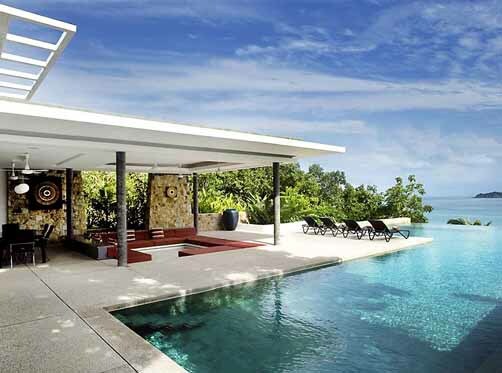 Opened in 2010, the Six Senses "sanctuary" provides a compelling alternative to the Amanpuri. 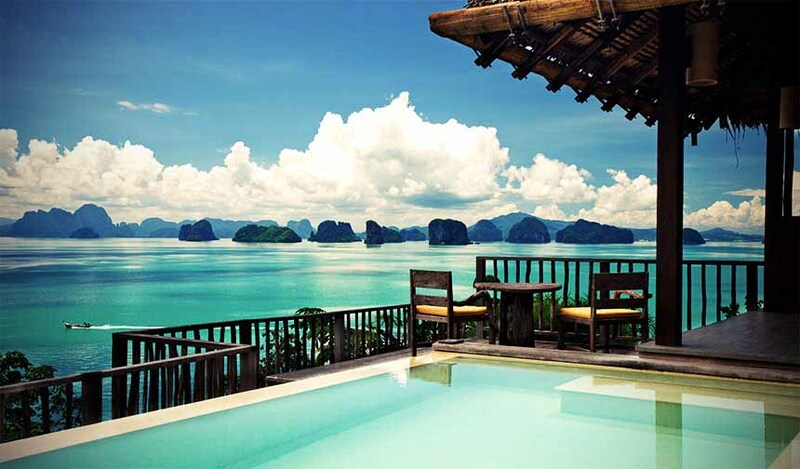 On the rural island Koh Yao Noi (an hour off shore from Phuket) is now the most exclusive resort on the islands. The wellness theme permeates the resort and is the ultimate stress escape as one visitor notes: "days quickly fall into a rhythm of treatments, organic food, workout sessions and alternative therapies from iridology to blood analysis. The day is followed by perfect rest and deep, deep sleep. It can be hard to get to early morning yoga or kayaking because the bed is so comfortable." The rooms feature signs made with coconut husks, sugar palm leaf thatching, earthy tones, textured walls and natural light. 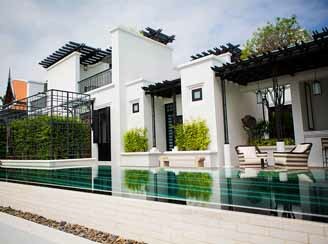 There are 61 villas and two ubervillas - the Enclave and the Retreat on the Hill that are palatial compounds. Privacy and wellness are paramount at this remote resort. An Orient Express (Belmond) property, recently-remodeled (2011). 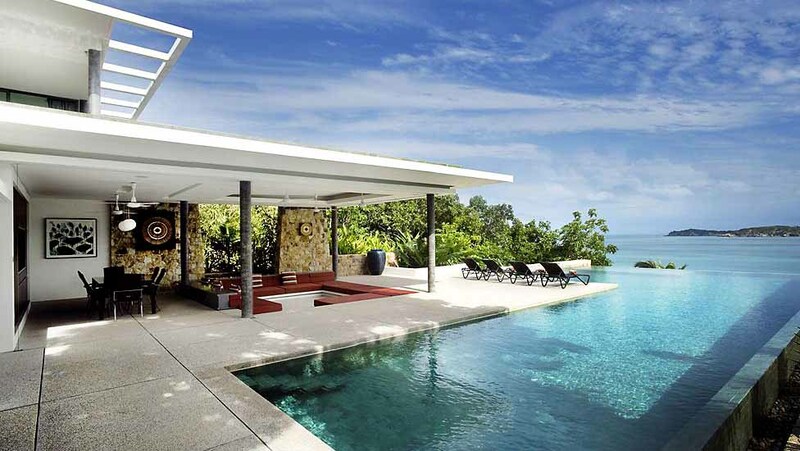 The Napasai is located on a tranquil part of the island at Maenam, on the quieter Northern coast of Samui-one of the most unique and private locations with magnificent ocean views. Napasai is a more intimate and value choice than the other top pick on Samui, the luxurious Four Seasons (on the other side of the island) and over the rustic Anantara. As is the Orient Express style featuring local traditional motifs, the 69 spacious rooms and suites are tastefully decorated in traditional Thai cottons and silks, wood and bamboo. The large baths are pleasant for relaxing after a long day of exploring the surroundings or water activities. Choose from a luxurious 2 bedroom Private Villa with pool, a Beachfront Family cottage (sleeps four), a Spa Cottage, a Beachfront Cottage (one bedroom) or a Seaview Cottage (one bedroom) for more dramatic views of the area. Thai cuisine, or seafood prepared with French. With a cooling exotic drink, relax at the bar or by the large free-form pool. The pool area is a standout, spacious with stunning views over the water and private beach. This sprawling resort feels quiet even when full, with generous outdoor spaces for privacy. On the least busy coast of Samui. The Napasai also features the best gym of any other resort. Krabi's, if not one the country's, most dramatic resorts settings is situated at the heart of the stunning Phranang Peninsula on the edge of Krabi Marine National Park. 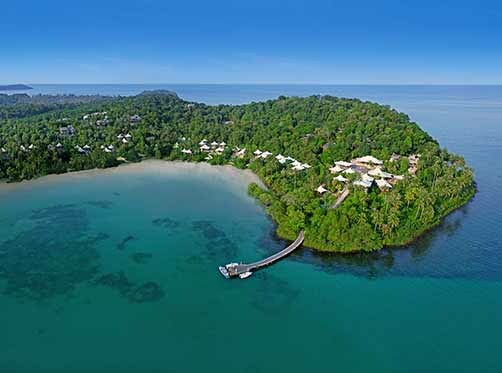 Rayavadee is nestled discreetly amidst tropical gardens and coconut groves against a backdrop of sheer cliffs, lush jungle foliage and the clear waters of the Andaman Sea. The secluded 28-acre resort is an oasis of lush gardens, meandering paths, ponds and just over one hundred stylish lodgings in idyllic setting are a perfect couple's or honeymoon escape, although families can be accommodated. Circular two-story pavilions feature spacious living rooms with full bars, entertainment centers, large bedrooms and baths with soaking tubs and walk-in showers. Family pavilions have two bedrooms; spa pavilions include outdoor Jacuzzis; hydro-pool pavilions have private pools. Four beach side villas each have a large pool, a master suite and one or two guest bedrooms. Krua Phranang, one of four restaurants, serves traditional Thai dishes. A luxurious spa provides a complete range of treatments. 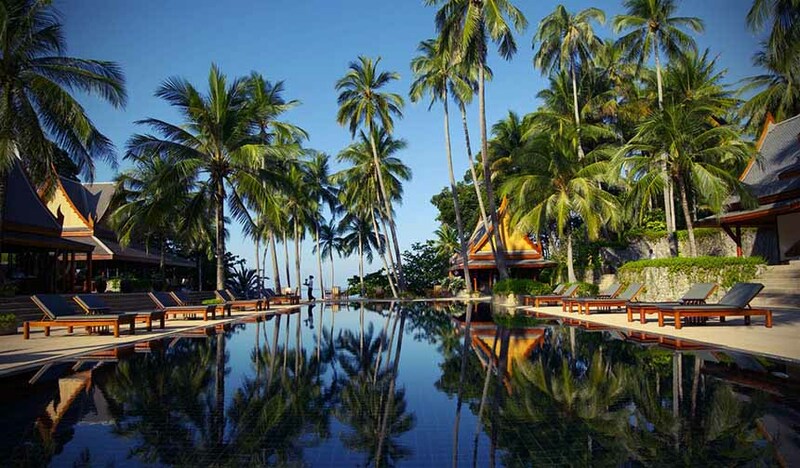 One of the most striking settings for a resort in the world, more remote and remove from more developed Samui and Phuket. Thailand offers an unparalleled selection of private villas on the islands, some regarded the very finest in the world. 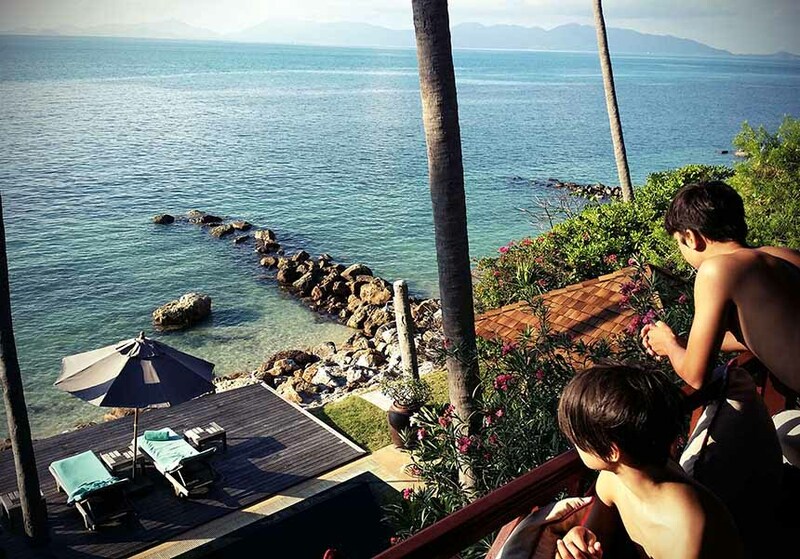 Contact for the perfect place to accommodate your family, friends, or a sublime end to your Thailand honeymoon. Many villas feature dramatic hillside and cliffside locations, with harmonious blend of luxury and nature, with enchanting views of the ocean. Secluded villas are havens of peace and privacy, offering peak tranquility. Pool, outdoors showers, hot tubs and broad terraces offer sublime outdoor time. Villas offer full-service ensuring experiencing the ultimate leisure stay, including on-site amenities and services such as day spas, a full-time in-house chef, wet-bar and gaming tables, and other service staff. The renowned luxury train journey through the exotic landscapes Thailand, Singapore, Malaysia and Laos. Step into a world of elegant glamor from a bygone era as you travel between ancient wonders and two of Asia's most interesting cities, Bangkok and Singapore. A trip on the Eastern & Oriental Express combines adventure with comfort and relaxation traveling aboard classical green and gold carriages featuring magnificent cherrywood paneling with colorful Thai silks and Malaysian embroidery. Marvel at the views as you Raise a toast as you meander through lush jungles, picturesque farmland and quaint villages, along riverways, past rustic ancient temples. Two to six-day journeys are offered, with stops that include Kuala Lumpur, the Cameron Highlands, verdant Kachanaburi, and one of our favorite small towns in Asia, Georgetown, in Penang. 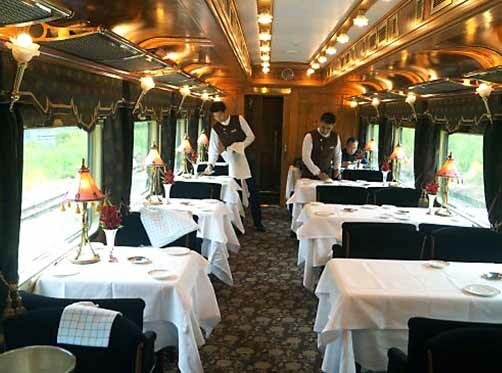 Enjoy afternoon tea service in your private compartment, before moving about the elegant public spaces, including observation, saloon, piano bar, and dining cars. Dining on the Eastern & Oriental has been designed by Thailand's premier chef, Ian Kittichai, of the famed Issaya Siamese Club and featured in our Culinary Capitals of Asia journey. Join chef Kittichai for visit to a local food market in Kachanaburi, learning about Thai food ingredients and cooking styles. Read more about Thai cuisine. Asia's only luxury train, transporting travelers into an elegant past. Start or end your Southeast Asia with this exceptional rail journey, spending time in Singapore and Bangkok before and after on one of unique itineraries with unique sights, activities and world-class dining. The Eastern & Oriental is also featured in our Grand Tour. Unlike other Thai Island destinations which have experienced dramatic developed over decades, Koh Kood has retained its remote and pristine setting of empty white-sandy beaches, lush jungles, pristine beaches and local village charm. Koh Kood, Thailand’s fourth biggest island, is its least populated with only about two thousand inhabitants, and therein lies much the island's attraction over busier places like Phuket and Koh Samui. 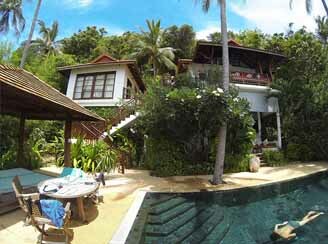 Koh Kood is known for having some of the most vibrant natural ecology in the country. The amount of different ecosystems, combined with the island’s low population and relatively unspoiled environment, mean that Koh Kood supports a large diversity of life – it has more biodiversity than the entire United Kingdom. The sea around the island teems with marine life, while the interior is home to wild animals, lush flora and an exotic butterfly population. Access to the remote island entails a bit more travel than other destinations, but the journey is smoothed by private plane and speedboat. Once on the island, there are only three dozen private and palatial villas spread over a wide area, offering peace and privacy. The resort features deserted beaches, ice cream shop, cheese room, and chocolatier, weekly cocktail receptions, yoga and mediation programs, and other spa activities, non-motorized water sports, language classes, and wellness assessments from the resident Ayurvedic doctor. 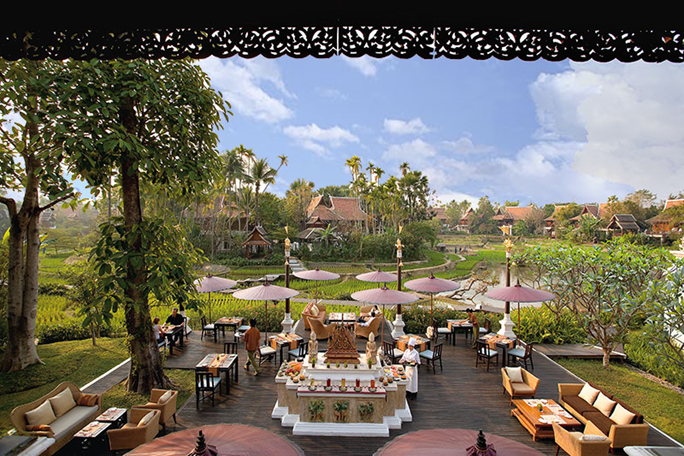 There are four restaurants, including Khun Benz, featuring upscale yet authentic Thai menus. A romantic idyll, Soneva Kiri is a perfect escape for a honeymoon, anniversary, or couple's getaway. Wellness is a priority at the resort and the Soneva Kiri's spa is comprehensive, and all the restaurant menus have plenty of healthy options. (And even the less healthy ones tend to be organic.) They profess a “slow life” philosophy and have a “no news, no shoes” motto. While they don’t ban devices, and the rooms and main lodge have fast Wi-Fi, other venues have none. They don’t hand out a newspaper fax at breakfast, and the rooms' well-hidden TVs only show DVDs. There’s no enforcement on the shoes, though many guests choose to do without, as do a lot of staff. Transit to Koh Kood is made easy with hotel check-in at the airport, short 1 hour 15 minute private plane flight from Bangkok's Suvarnabhumi Airport to Koh Mai Si (Soneva Kiri's Airport Island), with a 5-minute luxury speedboat transfer to Soneva Kiri's jetty. Along with the Six Senses on Koh Yao Noi, the Soneva Kiri is place for getting away from everything (but also lacking the distractions and diversions of other destinations, with few outside restaurants, markets, or nightlife). The resort's children's program is one of themost comprehensive in Thailand, from massive play areas and programs, to private exam tutoring.